didn't think it would work, but...eh, it was worth a try. Not the hero we wanted but the hero we needed. I'm so hülyé that I misspelled "hülyék" as "hujék". Yes, or: you are jerks. These usages are much common than "stupid". You say, "You are stupid". My professional reply is, "That's a projection!" "Hulye (stupid) is rude and hurtful. Silly ("buta") is less offensive and more playful. 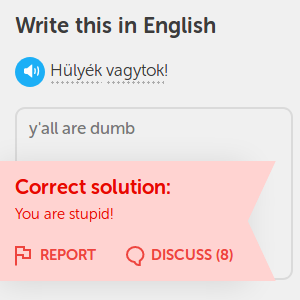 So - in Hungarian, as in English, it is incorrect to equate the words, "silly" and "stupid". Silly is less offensive like stupid and I would translate it to "bolond / bolondos"
I am glad this is one of those courses that does not shy away from teaching us how to insult people in their native language.